As Elon Musk’s ongoing campaign to piss off every journalist continued to make headlines, you may have missed a key bit of news: His secretive company Neuralink is funding primate research at the University of California as it pursues its quest to create brain-computer interfaces. So when, at some point in our weird inevitable future, you’re blasting around through tunnels on Mars in your mind-controlled Tesla, just remember how you got there. Privacy and anti-monopoly advocacy groups launched the Freedom from Facebook campaign on Monday, demanding that the Federal Trade Commission force the social media giant to break up into four separate companies. Sensing a moment of weakness, activists hope to establish stronger privacy protections and cross-platform communication. Google has pressed forward with its effort to provide artificial intelligence solutions to the Department of Defense, despite an internal employee petition against the company’s involvement in a pilot program that analyzes drone footage using AI and the resignations of around a dozen employees who objected to the program. But Google isn’t the only company partnering with the Department of Defense on Project Maven—the artificial intelligence pilot program at the heart of the controversy—and the Pentagon has explored the possibility of working with other major tech firms on Project Maven. One of the best controllers you can get for your PC or Xbox is the super customizable Microsoft Elite, but if you’re a PS4 fan you’ll have to go to third party peripheral maker Scuf to get any kind of customization. We’ve liked Scufs PS4 controllers in the past quite a bit, but its latest PS4 controller, the Vantage, throws out the PS4 design to create a hybrid even Microsoft would be proud of. There’s a new Star Wars movie out this week! The Last Jedi might still feel fresh in your mind, but Solo: A Star Wars Story hits theaters in just two days. Not been following all the news and reveals from the young Han Solo biopic? We’ve compiled all of the officially released info (no spoilers!) so you’re fully prepped to visit the seedier side of a galaxy far, far away. In a bipartisan letter on Monday, two US senators called on the FCC to investigate the identity theft and fraud in public comments collected by the agency during its proposal to rollback net neutrality protections last year. Senators Jeff Merkley, Democrat of Oregon, and Pat Toomey, Republican of Pennsylvania, are among the estimated “two million Americans” whose identities were used to file comments to the FCC without their consent. 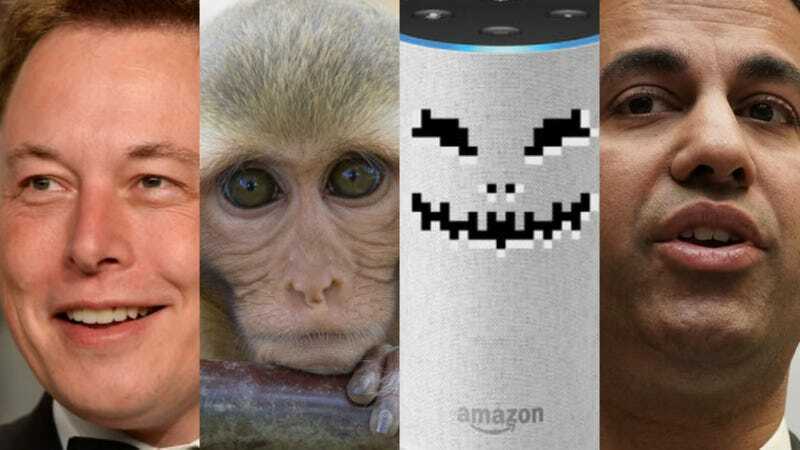 What’s the most terrifying thing you can imagine an Amazon Echo doing? Think realistically. Would it be something simple but sinister, like the artificially intelligent speaker recording a conversation between you and a loved one and then sending that recording to an acquaintance? That seems pretty bad to me. And guess what: it’s happening. At Google I/O earlier this month, CEO Sundar Pichai showcased an experimental Google Assistant feature called Duplex which can make routine phone calls on your behalf. In one striking demo, the digital assistant called a hair salon and scheduled an appointment with an employee at the other end in a voice punctuated with the vocal tics of a real human. The crowd roared. It seemed like an incredible display of Google’s prowess with AI. It was so futuristic, it was almost unbelievable. Yet it turns out there are some things so strange about the demonstration that several critics, emboldened by reporting by news blog Axios, have invested considerable energy into trying to deduce whether the impressive demo was doctored, or worse, altogether faked. A new CDC-led study just published in the Journal of Medical Entomology suggests it might be a great time to invest in a new fashion trend: bug spray-laced clothing. The study found that clothing treated with permethrin was able to stop several species of disease-causing ticks in their tracks, either paralyzing them or making them fall off the clothes. At Acer’s annual global press conference today, the company announced its usual assortment of new computers ranging from humble tablets built for education to the wild desktop rigs with dual Xeon CPUs. But among Acer’s avalanche of metal and silicon, there was one device that felt like an anchor for the company’s growth and success: the new Chromebook Spin 13. For more than a week, PGP developers have been rapidly working to patch critical flaws in the legacy encryption protocol used for sending and receiving secure emails; a tool that’s widely relied upon by lawyers, journalists, dissidents, and human rights advocates, many of whom operate at the highest levels of risk in shadows cast by repressive and unforgiving regimes. Progress is slow and as Gizmodo has learned, a number of exploits remain active, impacting at least two of the most popular PGP programs.